HAVE YOU RETIRED FROM PLAYING WOMENS FOOTBALL? 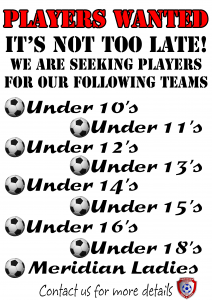 DO YOU STILL WANT TO BE INVOLVED IN GIRLS/WOMENS FOOTBALL? Meridian Girls & Ladies are looking for retired female players to become managers. There is no cost to you as we will put you through your Level 1 FA certified course. If you are looking for something to do on a Wednesday evening and a couple of hours on a Sunday, are reliable and friendly then please get in touch with the biggest ‘Girls Only’ club in Kent using the ‘Contact Us’ link. All applicants will be CRB checked. Meridian Girls & Ladies are always welcoming new players to the club. We have no trials or a selection process. All abilities welcome. If you feel that we are the club for you then please get in touch using our Contact link. Available positions will be updated (if needed) after the club’s AGM. Please check back soon.